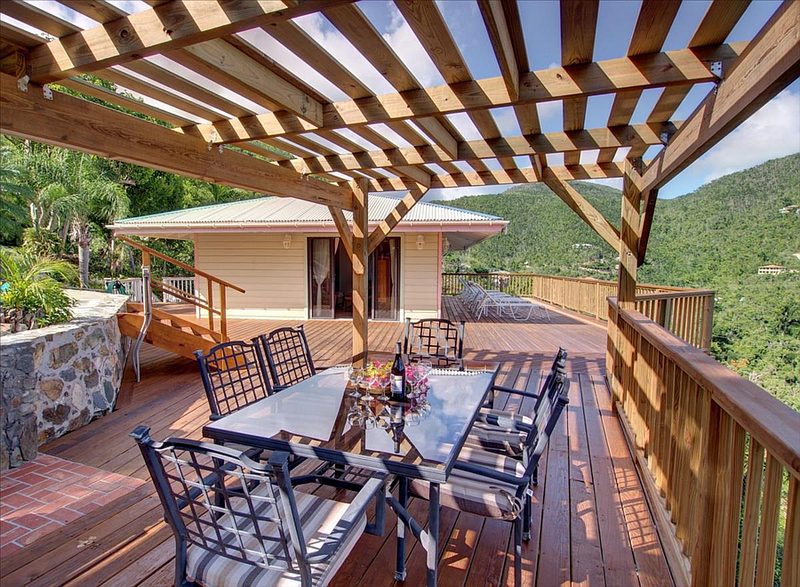 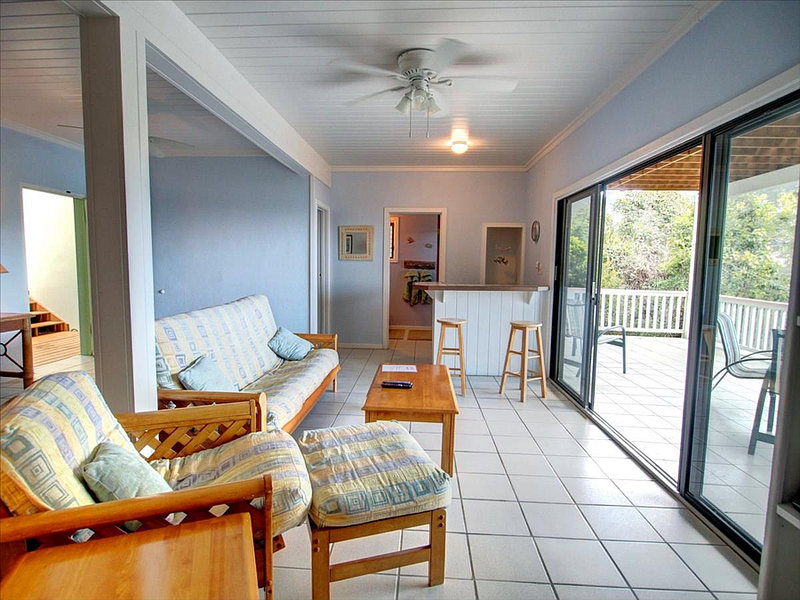 Welcome to Southern Exposure, a three bedroom, three bath spacious home on St John in the US Virgin Islands. 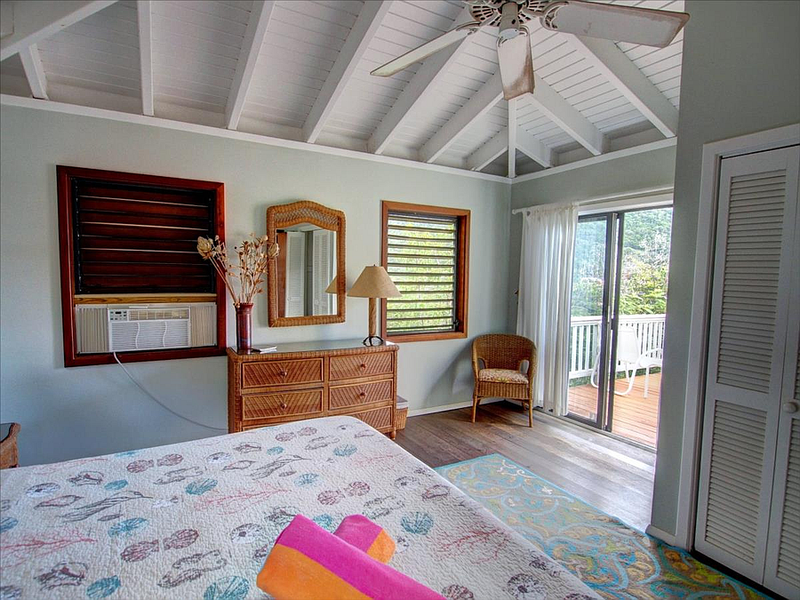 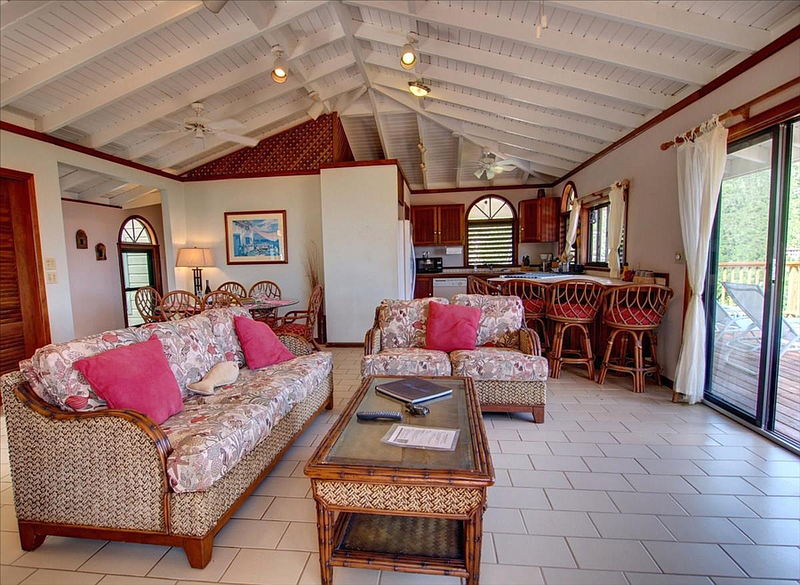 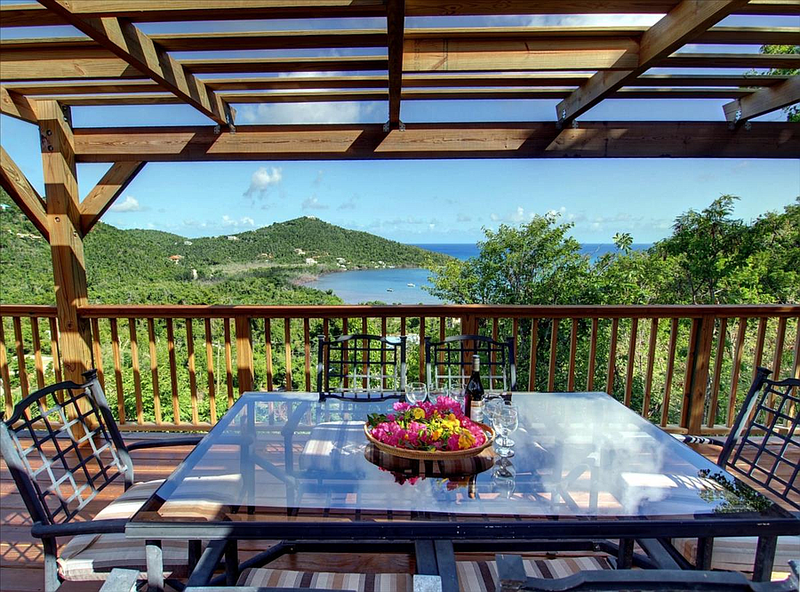 Built and decorated in true Caribbean style, featuring expansive views of the open sea, cooling trade wind breezes, and a huge, sprawling deck perfect for entertaining your guests, or for a private evening of stargazing. 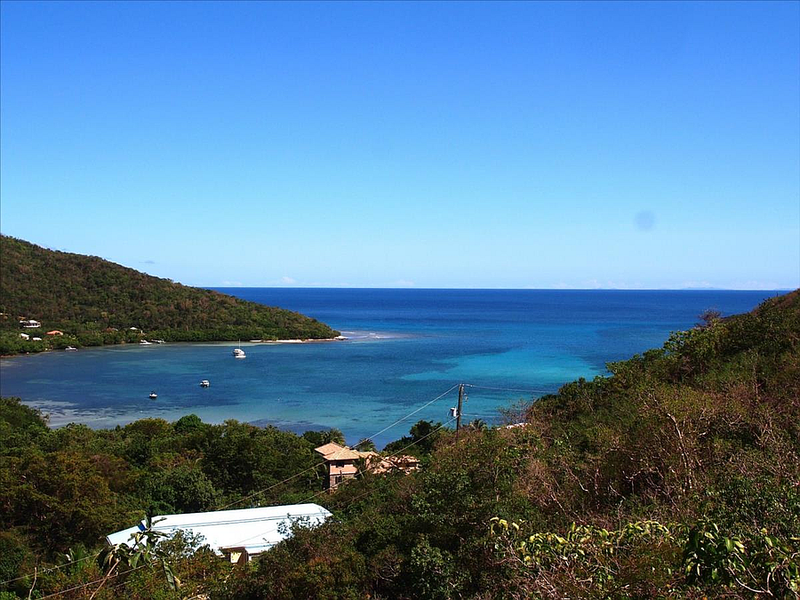 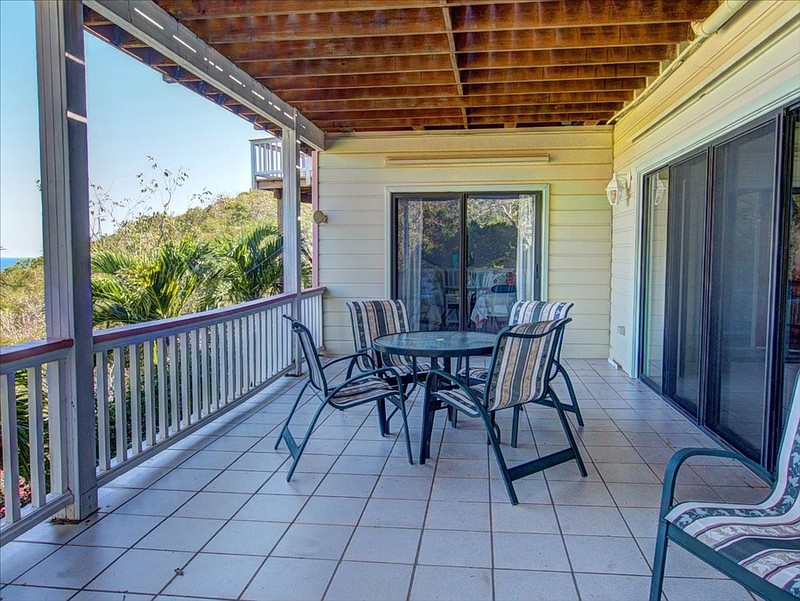 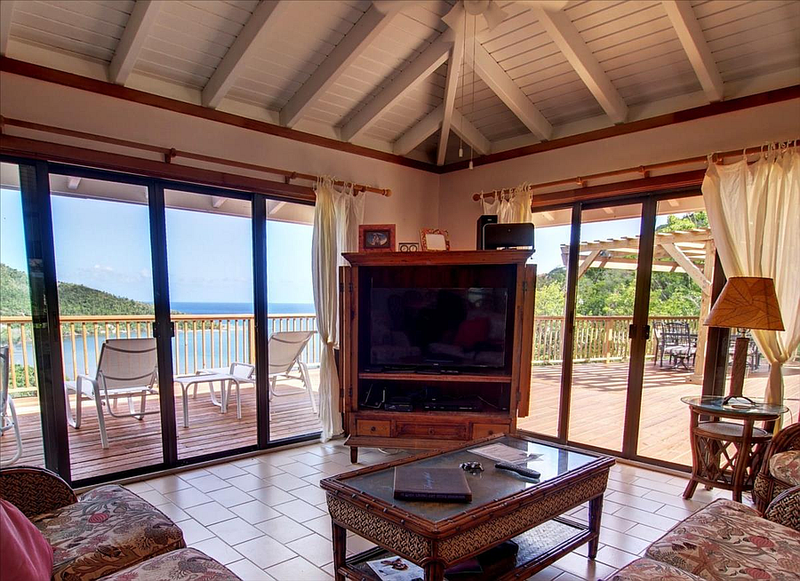 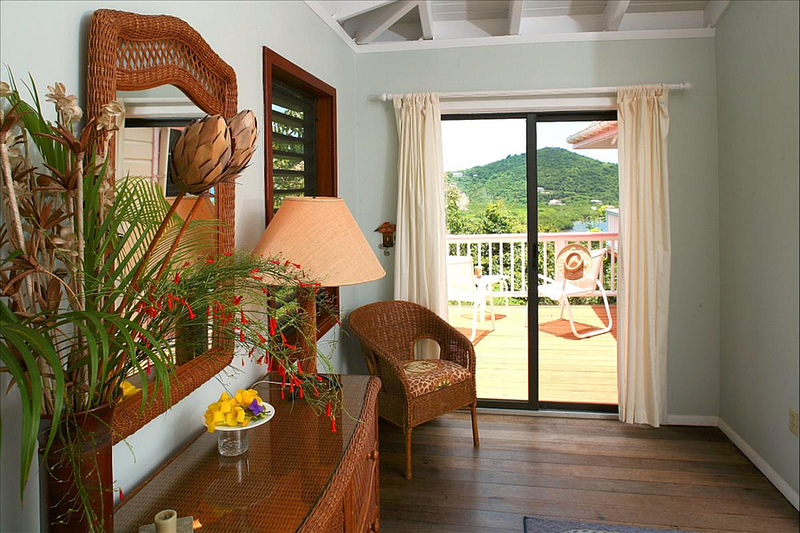 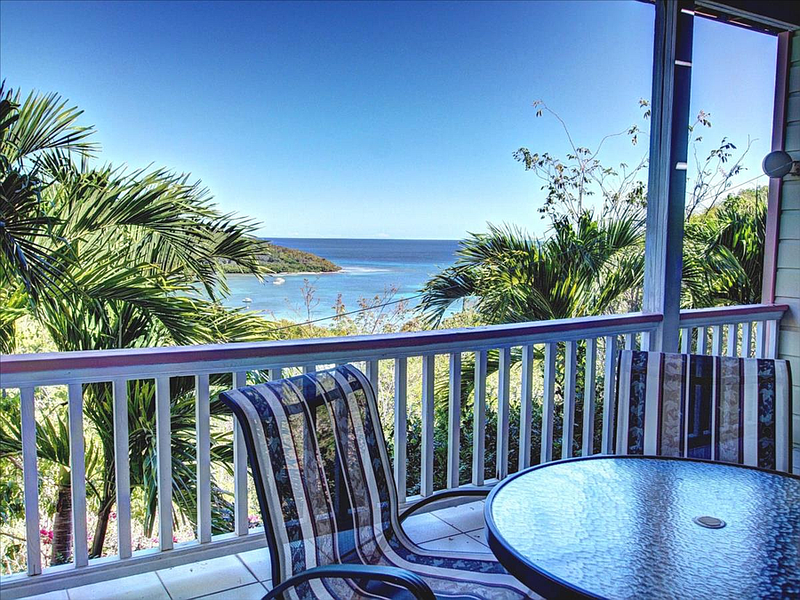 Day and night, deck views sweeping well past 180 degrees provide eye-popping vistas of the Caribbean to the south, and to the broad expanse of the Fish Bay valley. 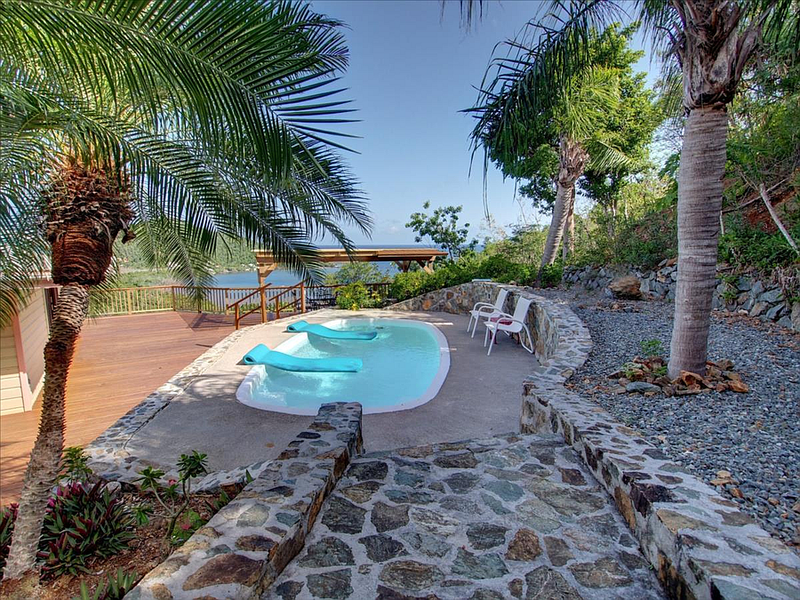 Here, you’ll bask in the warm glow of the morning sun as it rises above hills to the east, or while away hours watching sailboats at sea, and lose yourself in hours of dream-inducing evening stargazing. 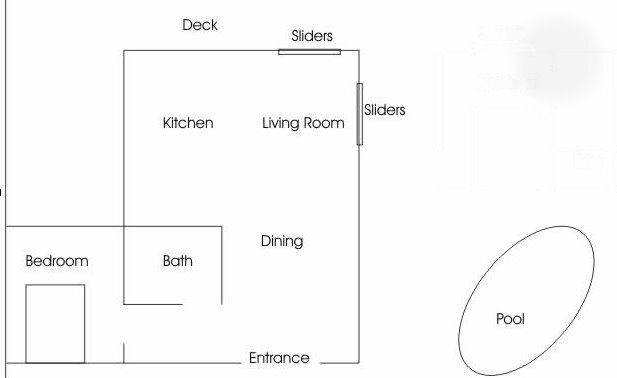 The upstairs/downstairs layout, each level with its own spacious communal living area and large deck, is perfect for families with children, or separate groups of couples wishing some ‘private space’ from time to time. 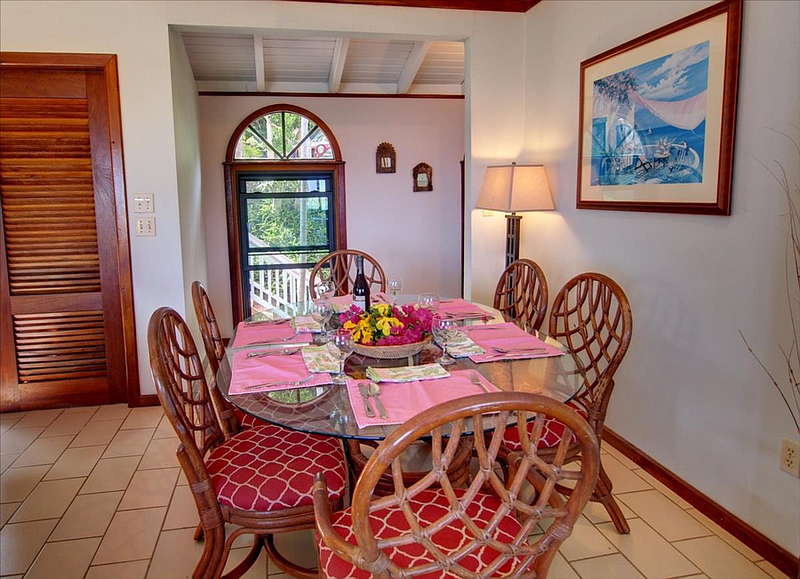 The main house upstairs (entrance level) features a living/dining area suitable for eight guests. 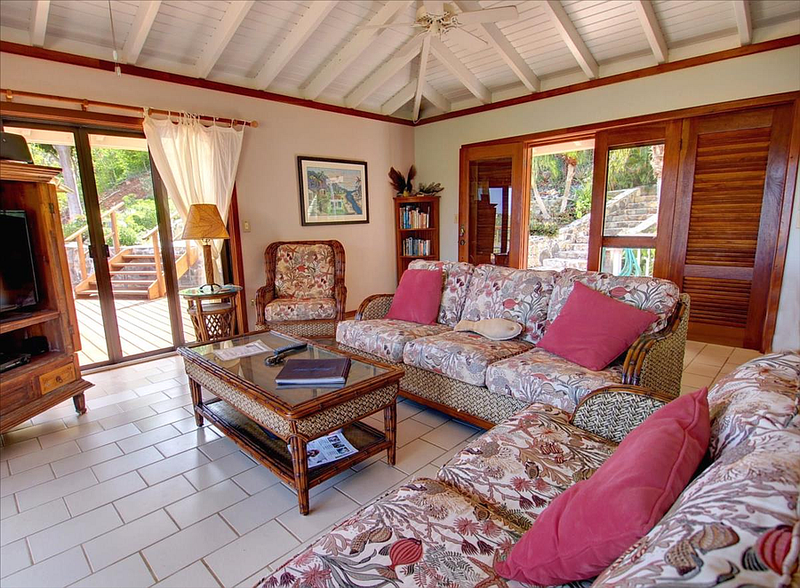 The villa owner is a dedicated amateur chef, and the kitchen is equipped accordingly, providing everything you’ll need to prepare sumptuous meals on those evenings when you’re just not up to going out. 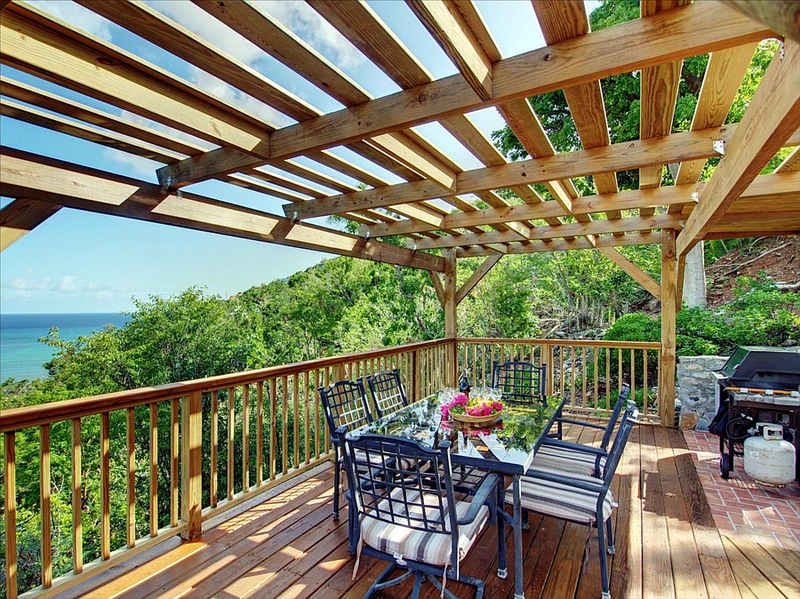 An outdoor gas grill easily accommodates any dinner party. 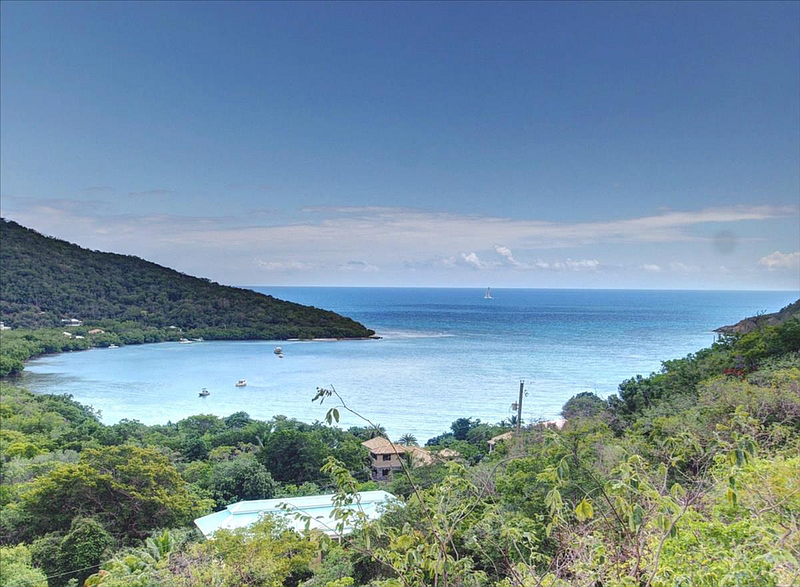 Away from the hustle and bustle of town, Southern Exposure offers guests the quiet and solace that brings people to St. John in the first place. 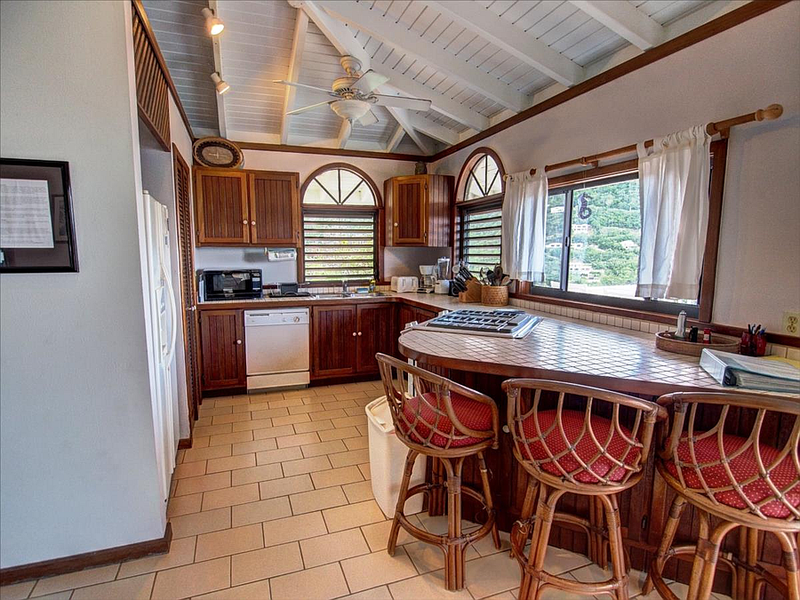 Fully equipped kitchen w/ dishwasher. 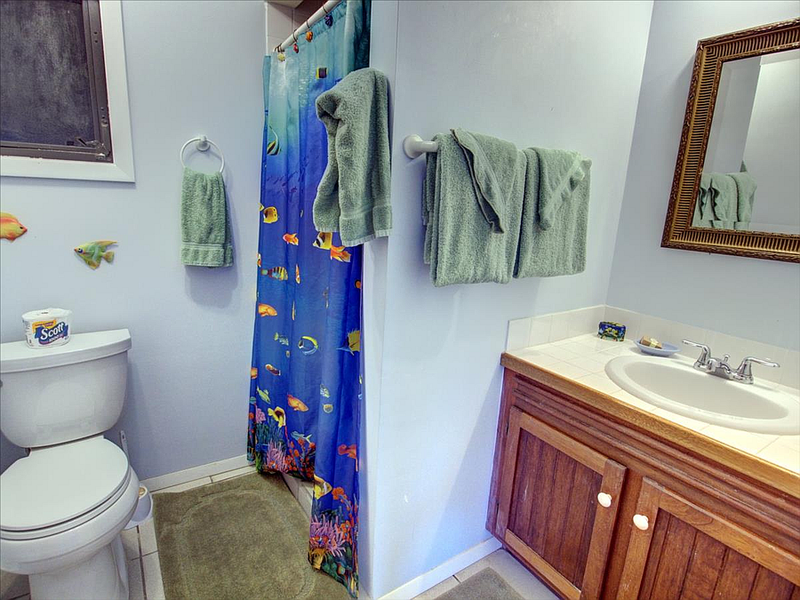 Laundry Room, Washer/Dryer, iron & board. 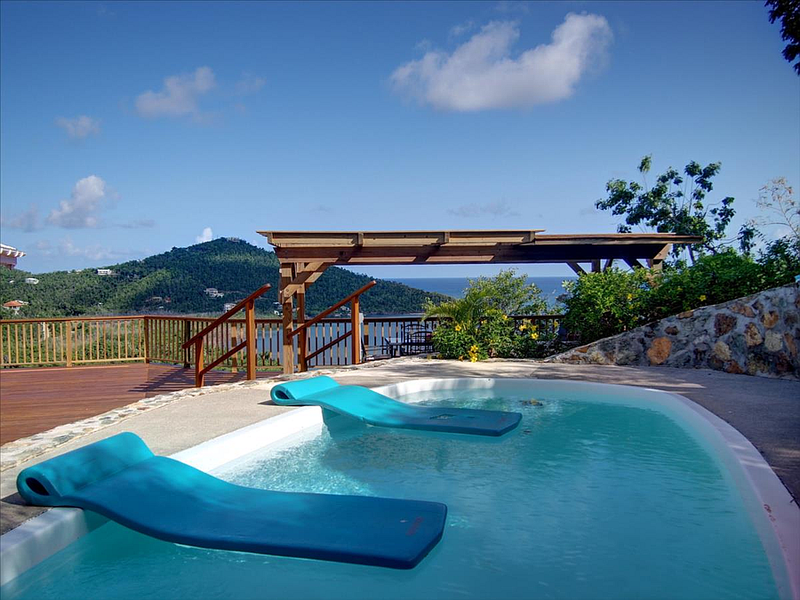 And of course, the raised deck pool, surrounded by beautiful native stone and coral walls and an array of colorful bougainvillea, Alamanda, hibiscus and palm trees, will keep both adults and kids entertained for hours. 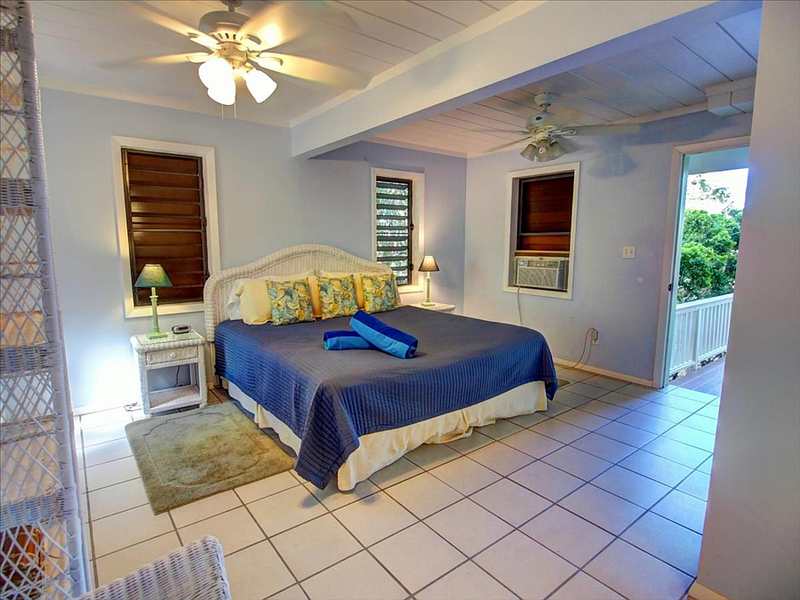 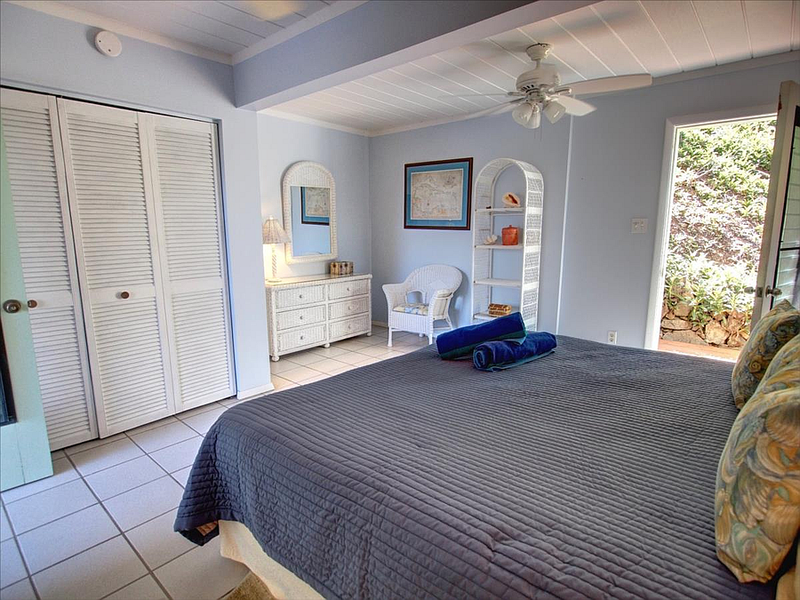 A second, beautifully appointed master bedroom is located inside the main house on the same level and features a private bathroom and spacious tile shower. 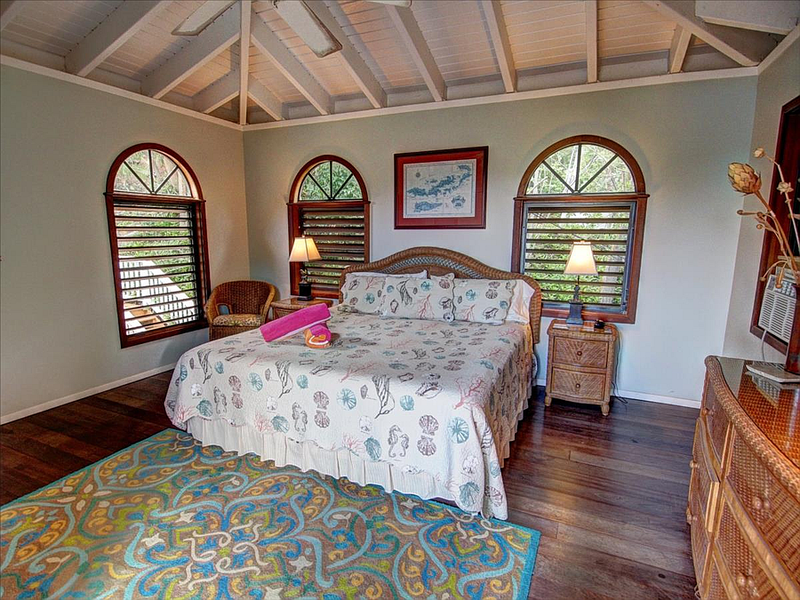 The main house master bedroom’s private deck. 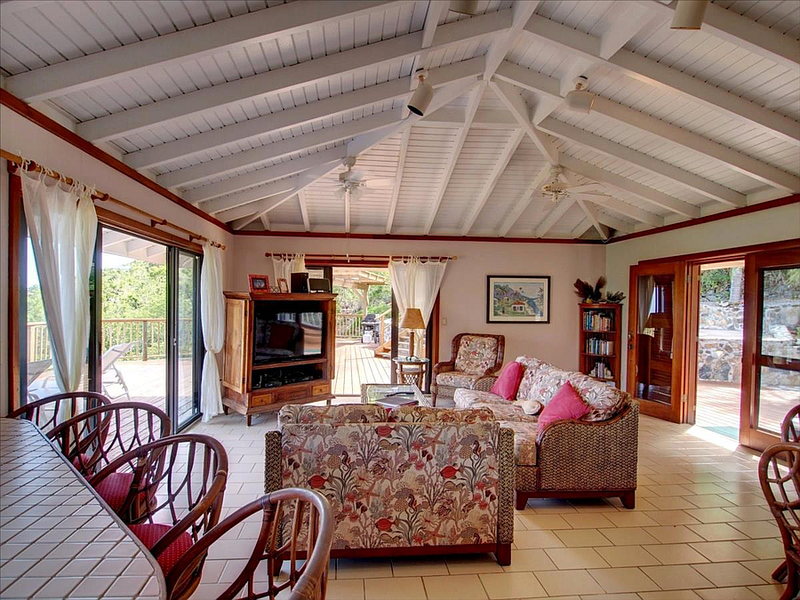 The main living area downstairs serves as a multi-purpose entertainment room, opening out to its own private covered tile deck with lounges, table, and chairs. 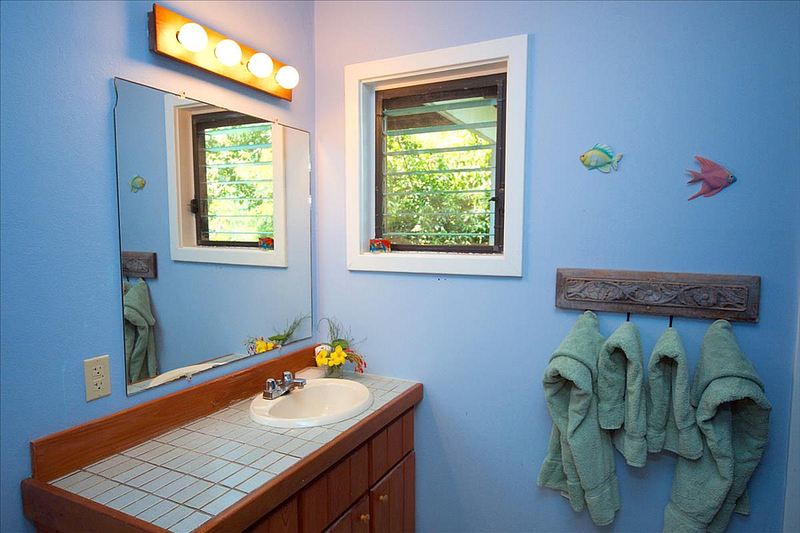 It has a wet bar, small refrigerator and two futons (that can be used as beds in a pinch). 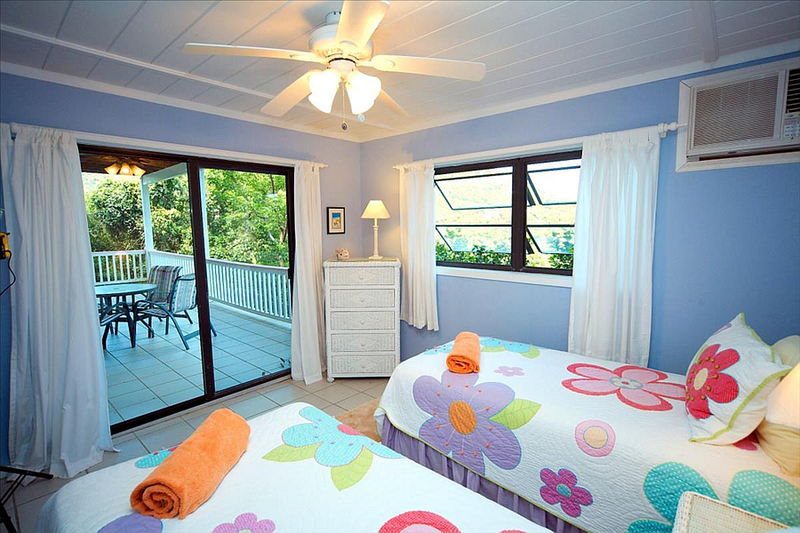 For families, it’s an ideal ‘kids room’ complete with games, TV w/VCR, and CD player. 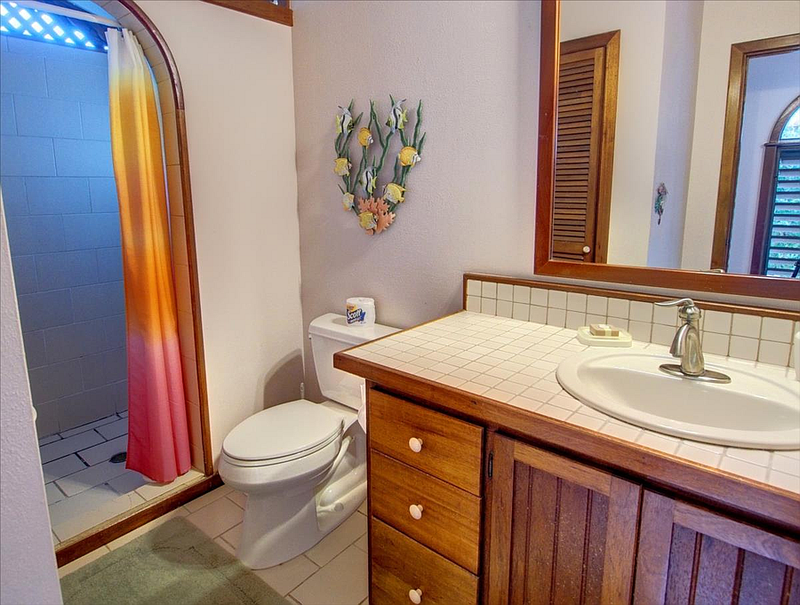 Both downstairs bathrooms are directly accessible from the living area here. 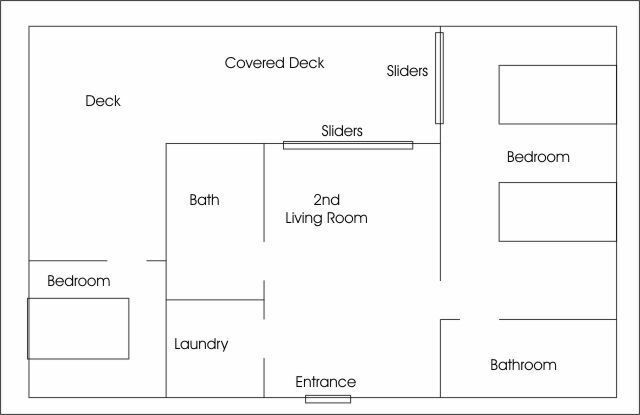 There is a laundry room in the lower level with a washer & dryer.